Mercury offer a range of office or home networking and data cabling solutions. We are well placed to run cable for your building's networks in conjunction with cabling for your security systems. This allows you to make real savings as you equip your premises for work. 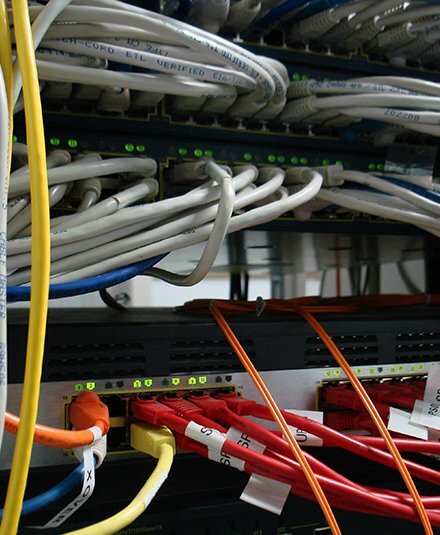 Data Cabling - If you already have an in house IT department, we can take care of the physical work of running cat5 cable for a new or existing network, fit comms cabinets and trunking, and leave the set up to your staff. Office Networks - We can help you to design a network to meet your needs, run cables and mount network points, install wireless internet and set up your switches and routers. The complete package from Mercury Security. Applications of Call Systems We believe that we are well placed to deliver your network. Firstly we run your network cable along with cable for your CCTV, fire alarm, intruder alarm and access systems system to deliver you real savings. But importantly, office networks can now act as the backbone for next generation CCTV systems. High Definition CCTV operates over TCP/IP networks. So why not have us install your networking and surveillance at the same time? Further more, many of today's access systems are network enabled, allowing administration from computer work stations. Fire alarms and intruder alarms are now able to use TCP/IP connections as part of your digital monitoring. There is high potential for TCP/IP technology in security, and we are therefore well placed to bring it's benefits to your business.